Fatigue in athletes is associated with muscle acidosis and the accumulation of Lactic acid. Storm Equus is designed to slow the onset of acidosis by improving the body’s ability to buffer (neutralise) the acid produced. Horses are able to maintain their peak speed or power for longer, or perform at a higher intensity for longer before H+ starts to accumulate significantly. Improved management of acidosis during exercise also means that training can be more effective and muscles will recover more quickly from hard work, racing or competition . Storm Equus contains combination of active ingredients which are completely unique to this product, most notably, ProCarnosine ®. Carnosine can be thought of as a biological sponge that is able to trap acid, and therefore delay muscle acidosis during exercise. Over a period of 1 month, Storm Equus can boost muscle Carnosine typically by up to 20% or more. Directions: Give 15g twice daily (1 scoop twice daily). 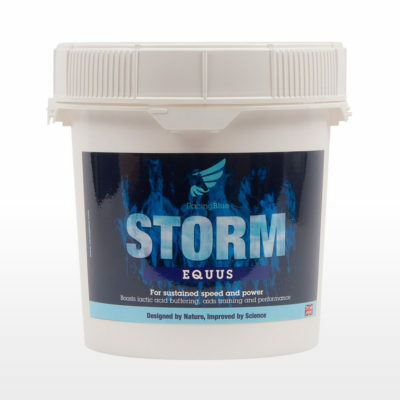 STORM® Equus is available in a 3kg tub that will last a single horse 100 days. A larger 12kg tub is available for larger yards. Each horse will require about 1kg of STORM® per month. STORM® conforms to the rules of the FEI as well as the BHA. It is also specifically approved for use by the prestigious Hong Kong Jockey Club and Singapore Turf Club.